I know exactly how lazy you are. That’s why Farmanator was brought into this world. You wake up in the morning and couldn’t care less about your plants. “Let them die” you think the moment you realise how soft your pillow is today. But then you remember… Le Farmanator. You pull out your laptop from underneath your pillow and open it up. Air temperature, humidity, loudness and light levels – it’s all there, it’s all good. And you may sleep another day knowing the winter didn’t come quite yet. Also no need to worry about remembering to check the data out on a daily basis. It’s stored to Firebase and you can view it for up to 30 days. Base Shield is attached to the Arduino Uno. Temperature & Humidity sensor goes to A0 on the Base Shield. Loudness sensor goes to A1 on the Base Shield. 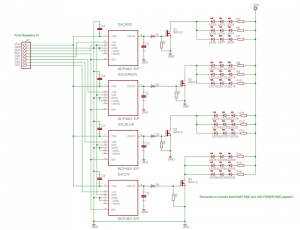 Digital Light sensor goes to 12C on the Base Shield. 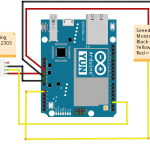 Arduino Uno is connected to the PC with a USB-cable. Check out the Readmes for more details about software. Prepare all the software by following up the instructions written on the projects’ github pages. Start by deploying or running locally the webapp, GreenFront. It might be a good idea to run it locally before deploying by just typing “grunt serve” in the root of the project directory. 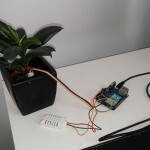 Then push GreenArduino source code to your Arduino Uno after attaching the Arduino Uno to your computer with a USB-cable. Now you may start executing GreenBack on your computer. After a while you should start seeing data appearing to your charts on GreenFront. In case no data is appearing to the charts on your GreenFront webapp check Firebase if anything is getting stored there. In case Firebase remains empty still after 10 minutes it is likely your computer is not able to read the values from Arduino Uno. This might be due to that your serial port is wrong – check GreenBack for more info to solve this problem. 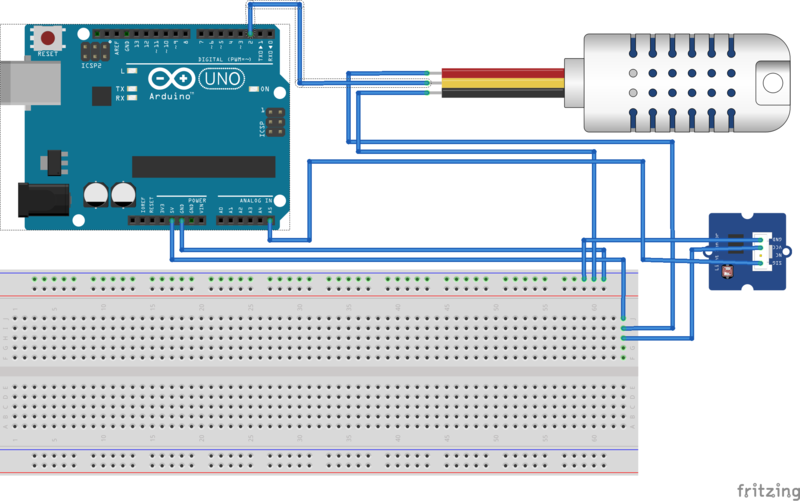 One of the main problems with Arduino Uno was to read the sensor data and send it out without any data losses. 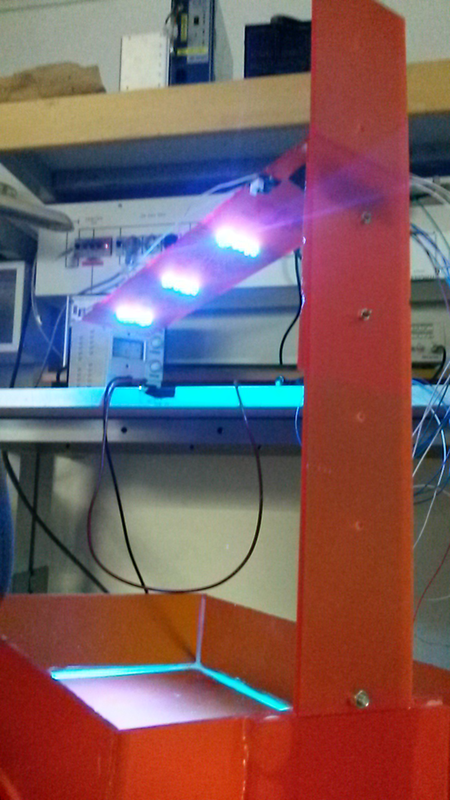 For example the Digital Light sensor is rather slow which had to be taken into account when handling the results. As it might take even up to 0.5 seconds to get the readings from the Digital Light sensor the code had to be written so that the value was requested long enough before it was needed. The way-around for the problem was to request the new readings immediately after using the current readings so that after 0.5 seconds when we want to use the new digital light value we have had the whole 0.5 seconds for the sensor to use. Another problem was that if too much data was sent too fast to the PC we started to suffer of data losses because the PC needed more processing time. The problem was solved by timing the outputs so that there was always a short delay between each print of a value. Now the PC could handle the data safely before receiving already a new value. Storing values to Firebase every 2 minutes would drown us in data already in one week. The problem was solved by compressing the data from each full day to 4 data events: average of morning, average of day, average of evening and average of night. Now instead of 24*30 data events for example for Loudness for one day we instead have 4 data events. This lightens up the burden on Firebase quite a lot as the amount of data stored is minimized. Furthermore we could improve our solution by maybe deleting all data events older than 30 days or by after a week compressing even the 4 data events from a day to only into a 1 data event. 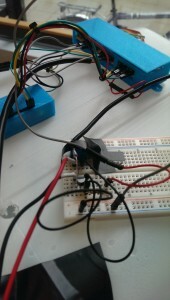 While working on the project Arduino Uno was almost constantly running. In some cases it ran even a few days without interrupts. The web app then was a good way to view how our data was getting gathered. Also a look on Firebase gave us a good perspective on how our solutions were working. And in some cases thanks to this method some bugs got noticed and fixed on time. This entry was posted in Yleinen on 23.6.2015 by Jasu H Viding. 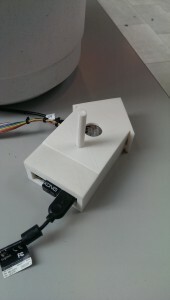 A device for measuring temperature and relative air humidity. It measures and sends the data to the backend server every 5 minutes. 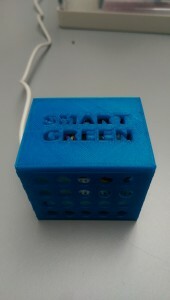 One aim of the project was to make a small affordable device which could be placed to almost anywhere. Parts ordered from Ebay cost about 5,50€ per device (excluding jumper cables, 3D printed box and USB charger). Data is displayed on a dashboard web page which allows the user to follow changes and latest measurements from the device easily. All devices send a device identifier with the data so users can have multiple devices measuring at different locations. Backend is running in Heroku (PaaS) platform and data is stored to MongoDB (MongoLab). The voltage regulator in the diagram should be a 3-pin low-dropout regulator (5V to 3.3V) with a couple of condensators. In the project we used regulator modules that include these, but unfortunately this module is not available in Fritzing libraries. The parts are put together on a small breadboard which is just enough for the few parts used in this project. The hardest part of building the device was creating a proper HTTP request using an ESP 8266 wifi module. The module communicates with AT commands which are printed to a serial connection. AT+CIPSEND’s command value must be exactly the amount of characters in the request. Also the content length value must be correct so that the request is valid. // CIPSEND value and Content-Length in the request must be correct! During the development the device run three weeks successfully. During this time all the measurements were received by the backend server. This entry was posted in Yleinen on 22.6.2015 by . Our original goal with this project was to build an environment where you could leave your plant unattended for weeks at a time. Environment should report the condition of the attached plant, surrounding environment and amount of water left in tank. It should also be able to water the plant automatically based on humidity threshold levels defined. As you’ll see, this last part was not yet achieved. 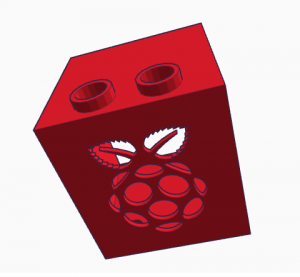 We use Raspberry Pi with Raspbian as a central piece of the system. Main reasons for this is a wide range of on-board connectors, and flexible, well supported Linux operating system with Node.js support. This is just as simple as connecting it to USB port and installing fswebcam. Measure and temperature are measured from both soil and air. Both sensors are manufactured by Sensirion, for soil measurements we use SHT10 in a metal casing, for air measurements SHT15. There’s supposed to be a huge variation in durability of soil moisture sensors, and SHT10 seems to perform very well. It needs one 10k resistor from data to 3.3V, as seen in wiring diagram. SHT15 is connected straight to RPi. Water level is measured with ultrasonic sensor connected inside the roof of the water tank. 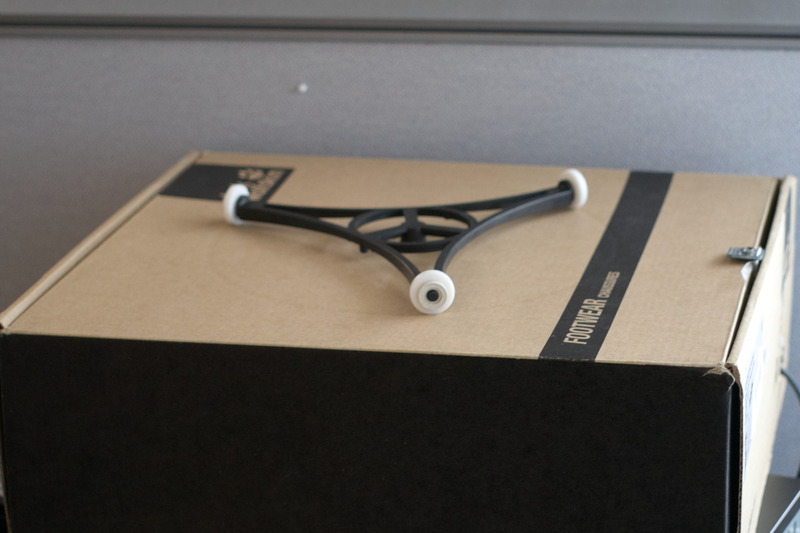 We use DFRobot URM37 sensor. It requires two resistors connected to TX connector: 1k between TX and RPi’s RX, 2k between 1k and ground. Solenoid is used for controlling water flow. It needs a separate 12V power supply to work. 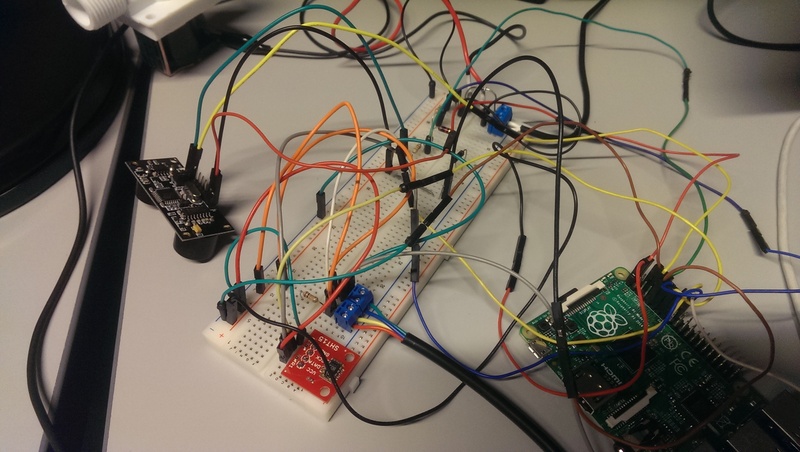 Only a trigger signal is sent from Raspberry Pi. There’s a 400R resistor between GPIO and transistor base. Transistor is NPN transistor 2N3904, diode is 1N4001. This part requires experimenting, as we couldn’t get stable output from our solenoid before the project deadline. The part was most likely broken as it worked out fine when dry, but stopped after water was put through it. 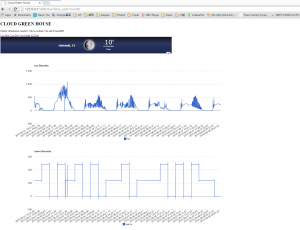 Frontend uses AngularJS with Highcharts to visualize the data. It’s a single page application which we host in Firebase, the same place we store in and read our data from. There’s a Github repository and Firebase hosting guide to get it all running. In order to show the saved data, you have to enable certain measurement types. The data is drawn based on sensors object, which lives in your database. Units are only saved for clarification at the moment. Next steps with the frontend would be to refactor the code to support data binding, and to improve the performance by limiting number of fetched data points. The backend is written using NodeJS and is run as a Forever service. The complete backend code is found in the Github repository. 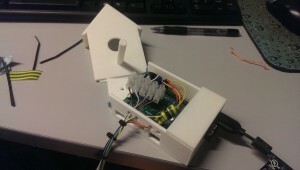 For the SHT1x based sensors (air and soil moisture and temperature) a modified library based on Keitos where support for multiple sensors were added was used. At the current state the sensor data is read periodically and posted to the Firebase service. Also a webcam image is captured and posted to Twitter as a media tweet. However, the solenoid valve is not triggered automatically. One of the reasons for lack of this support is that the valve we had did not work well enough for us to test enough. The next step would be to build a support for this. The casing for the device is designed using the lovely Tinkercad and 3D printed using the MakerBot Replicator 2. 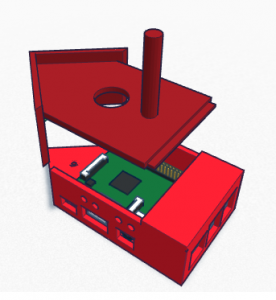 Casings were designed for the Raspberry Pi B+, sensor connector PCB, URM37 and solenoid valve. We noticed that the appearance of the complete setup with all the wires going from the main unit to the sensors through the connector unit is quite messy. 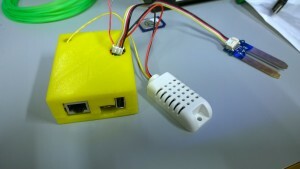 The design could be improved by either using wireless sensors or designing both the main unit and the connector board in a single unit. This entry was posted in Yleinen on 22.6.2015 by Antti Laakso. Phototropism, basically, causes plants to grow towards the Sun, or other source of light. In many situations, such as with the casual home gardener who grows his/her plants on a window sill, plants only get light from one general direction. As the home gardener turns his/her back to gardening duties just for a few moments (weeks), the plants might have already found their way out of the pot and, without support, creeping around their surroundings and robbing the gardener of their initial visual delight. There is an easy solution to the problem posed by phototropism: turning the plants every now and then. However, such daunting, repetitive tasks are not for the great minds to trouble themselves with, so, a more automated solution is in order, and that is what we set to build. Our solution forms around a very simple design using a microcontroller, servo and light sensor. 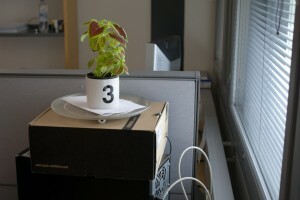 The design has the plant sitting on a rotating platter that can be, ideally, turned to any angle driven by a servo. 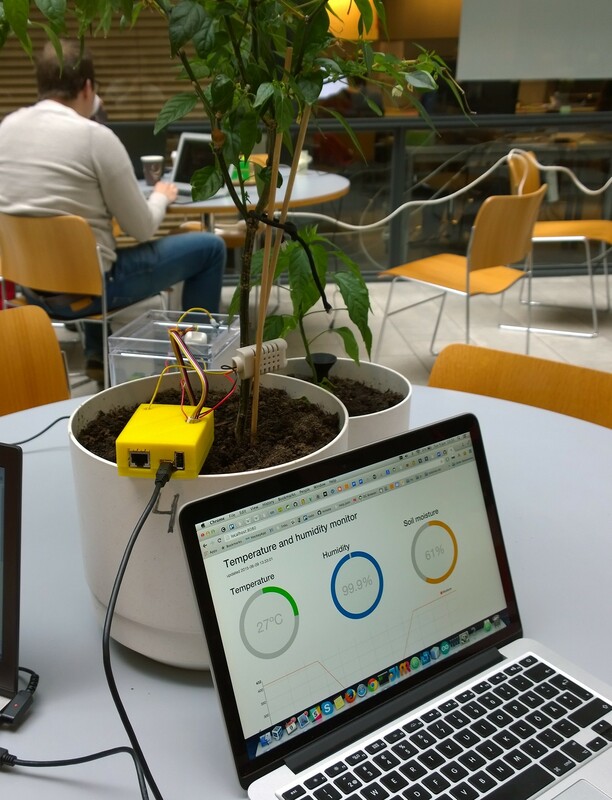 A light sensor serves to gather information on the amount of light received by the plant during a given period. A simple algorithm in the microcontroller will then rotate the plant so that in a given time frame each side of the plant will receive a similar amount of light. We used Arduino Yún as the microcontroller of choice, mostly because it happened to be the only microcontroller available; we did not want to use a “real computer” such as Raspberry Pi or one of the similar Intel creations. For learning, a limited platform sounded more interesting. The light sensor we got was a digital one, namely, Adafruit’s TSL2561 and the servo an AAS-752MG High Performance Race Servo (High Speed). The Yún version of Arduino is really nice for the IoT purpose, because it has an integrated WiFi board, meaning much less hassle with getting the project online. not for extended periods of time or large amounts of water. The first problem we faced with the design was that a servo usually only turns 180 degrees whereas we needed close to 360 degrees of movement. The problem was ingeniously solved by using a microwave platter and the wheel system below it to amplify the servo’s amount of rotation. A proper gear system would have been better, but we never got around to building that. A follow-up problem was connecting the servo to the microwave platter’s drive system, and that we solved by 3D printing a suitably sized shaft part and attaching that to the servo with rubber bands – a somewhat crude solution, but the 3D printer’s resolution didn’t seem to suffice for a proper toothed servo attachment. 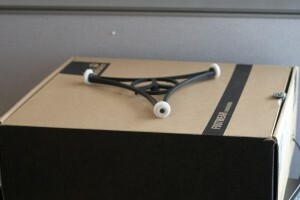 Although, we never got the highest resolution printing to actually work with the PLA filament. The light sensor was taped to a side of the shoe box that faced the light source. The light sensor, being digital, appeared to work fine out-of-the-box, but…on a sunny day the thing decided to overload after all. So, as we only needed relative light readings instead of absolute ones, we fashioned a small shade out of paper for the sensor to limit the incoming light. The servo and the light sensor were both connected to the Arduino board as shown in some examples. So, no fancy electronics skills required. We started the Arduino part of the implementation by playing around with example code for the servo and light sensor libraries. Much of the heavy lifting is hidden in the libraries, so driving the servo and reading the light sensor is really easy on the Arduino. The control logic was created on a less-than-rigorously-scientific basis. The platter was given three possible positions at 0, 120 and 240 degrees – remember that a servo turns to absolute values. The microwave platter system seemed to amplify a turn by approximately 1.6 times, so, the corresponding servo values were 0, 75 and 150 degrees. A day (24 hours) seemed like a sensible period between rotations. Rotating the plant too often would probably disturb the plant as well anyone in the same room as the plant. The luminosity values are averaged for a short period (20 secs) and then the averages are summed up to get an accumulated value for a day. The accumulated luminosity values as well as the servo positions are saved in a history queue (ten days) and a decision to rotate or not the rotate the platter is made based on the history data: choose the position that has received the least light according to the history – a typical scheduling algorithm in essence. When the Arduino has connectivity, luminosity and servo position data is uploaded to a database every minute. As a smaller task, the Arduino code also updates its idea of date from the WiFi component once a day. Otherwise there would be clock shift between the microcontroller and the WiFi board (and the real world), which would ultimately prevent database uploads. We chose to use Amazon DynamoDB as the database backend for this project. There is an example project with source code (googlable) that uses DynamoDB, but after creating the accounts and setting up the DynamoDB database, we found out that the code to do the required hash calculations for Amazon authentication takes so much space on the Arduino that there is very little left for anything else. The Arduino also seems to start getting unstable when the dynamic memory runs low – so heed the warning given by the Arduino IDE. We stuck with our choice. Fortunately, Arduino Yún’s WiFi component has an OpenWrt Linux environment with Python and all that stuff. So, the Amazon hashing and upload was implemented as a Python script and called from the microcontroller side using the Arduino “bridge” interface, leaving proper space for actual program logic in the microcontroller. Lesson learned: mixing microcontrollers with authenticated REST APIs is plain stupid. One additional problem faced with the servo was that it was just too fast. An off-center plant might be thrown off the platter. As a solution, the servo control was slowed down by turning the servo one degree at a time towards the chosen next position and inserting a delay of 100 ms in between. The database frontend was written in python and a Google API was used to draw graphs from the data. Lacking a suitable hosting provider, we ran the prototype web server locally on a laptop. 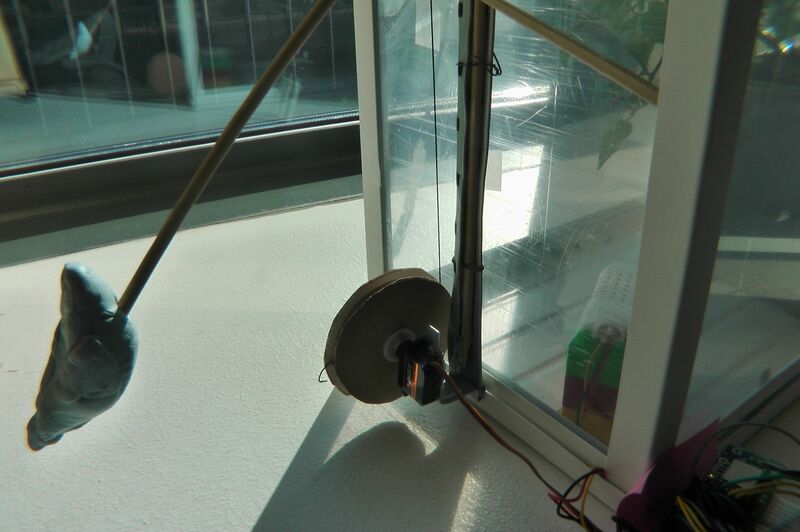 The light sensor was tested separately on a sunny week. As the weather has been mostly grey-ish this far, it was lucky to have a few sunny days during the testing period. Testing revealed that the sensor by itself overloaded (producing zero measurement result) when in direct bright sunlight. Therefore, we needed to insert a filter. The whole system was left running with a plant on it for a week. However, such a short testing period did not really reveal much since plants do not grow that fast. Proper testing would have had a control plant with no rotation sitting near the system and done for at least a month to see the results. Just before the demonstration, the WiFi password had changed at the department, which we didn’t know, and spent half a day wondering what had gone wrong the Arduino. (The experience did teach something new, though: you can log into the Arduino WiFi component with a Serial console sketch and configure the WiFi with an OpenWrt commandline tool called uci.) Also, at the demonstration, the upload naturally did not work as changed electrical outlets seem to affect WiFi connections or configurations. Just something to consider..
At the demonstration someone remarked that using the microwave platter was the mechanical innovation of the day. 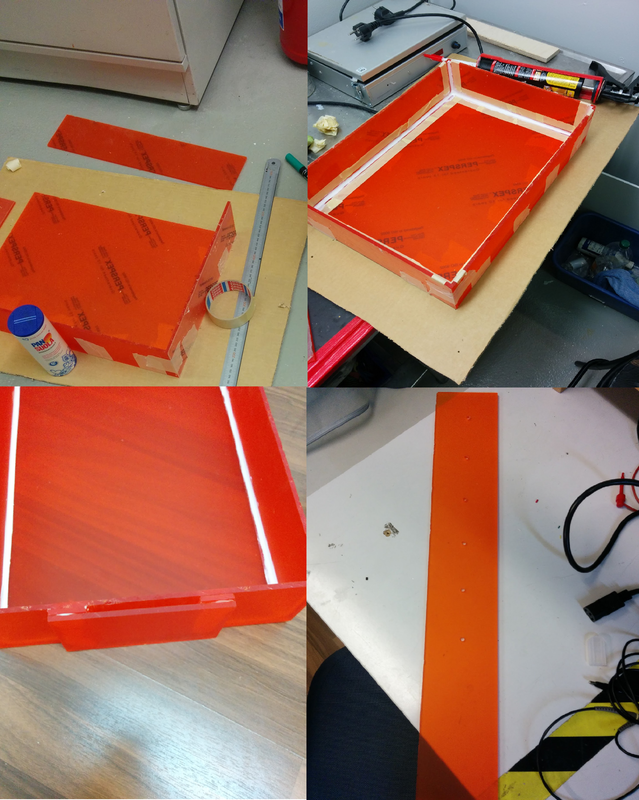 Generalising from that remark, the whole project consisted of a rather tight schedule to put together a working system out of some proper parts and lots of duct tape, and as such, coming up with the “duct tape” to bind everything together was the interesting bit. In a whole system that spans from a light sensor to a cloud-based database, there are lots of technologies involved. One might have to learn from microcontroller programming to REST APIs and from soldering and using mechanical tools to 3D CAD design and 3D printing. Hydroponics is a method of growing plants in nutrient solution without soil. Hydroponics is an efficient way of growing plants as nutrients are delivered directly to the roots in soluble form. 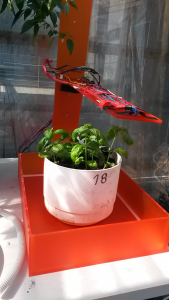 It enables plants to allocate more resources to leaves, flowers and fruits. 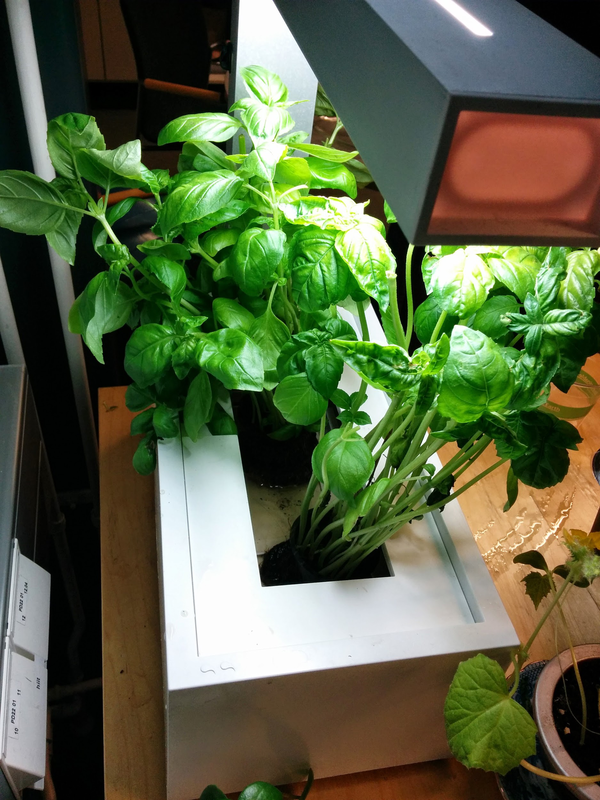 We decided to create a small-scale hydroponics system with constant water flow. 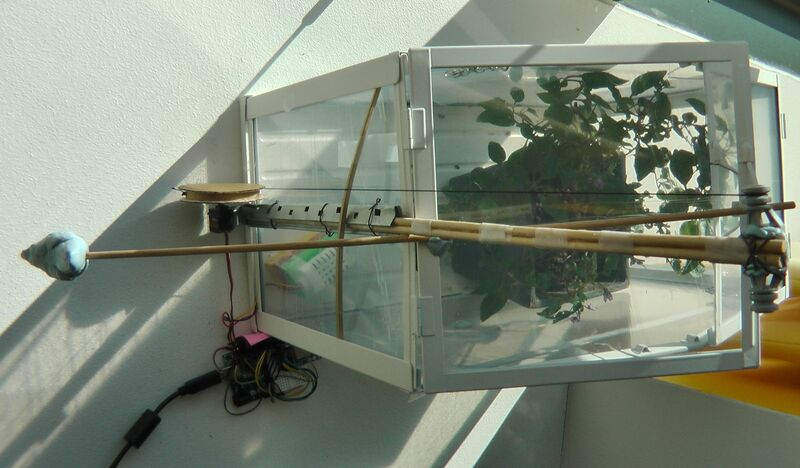 There are many such hydroponics systems commercially available, but we wanted to design our own. Our idea was to build a modular system consisting of a nutrient solution tank, a water pump and separate plant containers that could be connected to form a hydroponics system of 1 – 5 plants. Sensors attached to the system would measure temperature, humidity and lightness of the surroundings. Our initial plan also included measuring nitrate concentration of the nutrient solution and adjusting the amount of nutrients according to the measurements. However it turned out that nitrate sensors are expensive and difficult to get, so we gave up that part of the plan. Instead, we used a simple water sensor in the tank to detect when more water was needed. All our sensors were Grove system compatible which means that the sensors could be connected to a Grove Base Shield on top of an Arduino Uno microcontroller without tinkering. 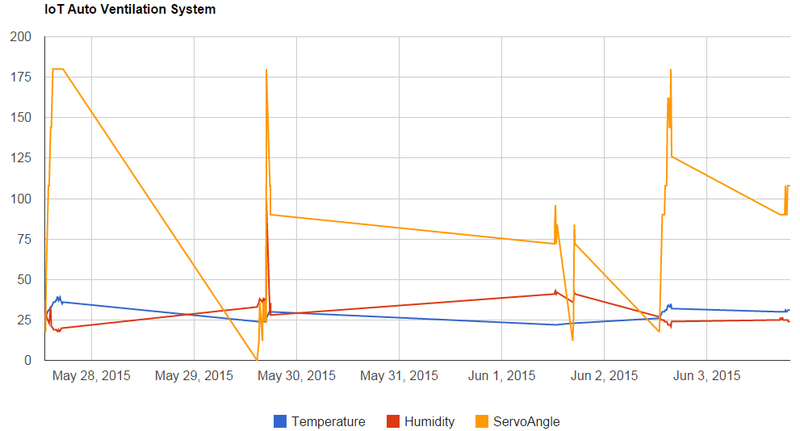 We used Grove Luminance Sensor to measure amount of light, Grove Temperature & Humidity Sensor Pro to measure temperature and relative humidity and Grove Water Sensor to detect when the tank was empty. For wireless networking, we used a separate Adafruit CC3000 Wifi Breakout plugged into the base shield. In addition to electronics we had a small Jebao AP-300 aquarium pump. 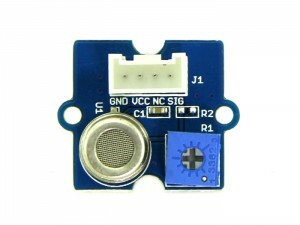 Grove Water Sensor detects presence of water by measuring conductivity between interlaced sensor traces connected to SIG/VCC pins and ground traces connected to GND pin. When the sensor is exposed to water, conductivity between sensor traces and ground traces increases and voltage value in SIG pin becomes low. Otherwise it is high. We connected the sensor to the base shield’s digital pin and used it as a simple water detector. The sensor could also be used to measure changes in electric conductivity of nutrient solution by connecting it to an analog pin. 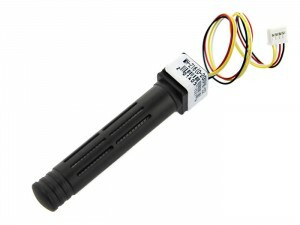 Grove Luminance Sensor contains an APDS-9002 lumen sensor . It is a simple analog-output sensor that peaks approximately in wavelength range 400-650 nm. This is very close to the spectrum of human vision. With standard 3.3 V input current, the sensor outputs a value between 0 and 1023 which is converted to voltage by simple arithmetics: output voltage = 3.3 V * output value / 1023 . 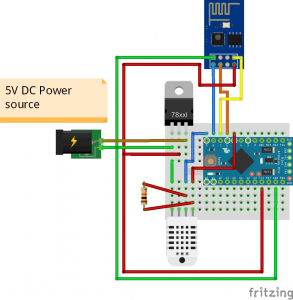 Voltage values above 2.3 V are inaccurate and mean that the sensor is saturated by light. The output voltage can be linearly transformed to a lux value. 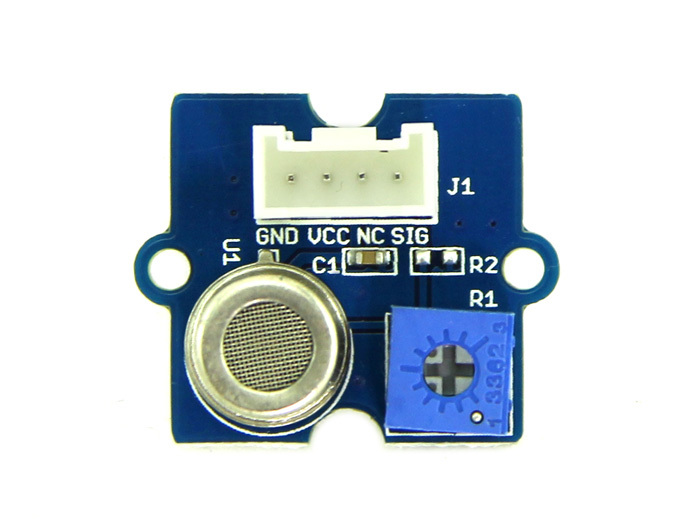 Grove Temperature and Humidity Sensor Pro is a DHT22 sensor with a capacitive humidity sensor and a thermistor. It outputs a 40 bit digital signal consisting of a relative humidity component (8 bit integer + 8 bit decimal), a temperature component in Celsius degrees (8 bit integer + 8 bit decimal) and a checksum (8 bits). Getting data from the sensor requires carefully timed signal exchange between the sensor and the microcontroller. 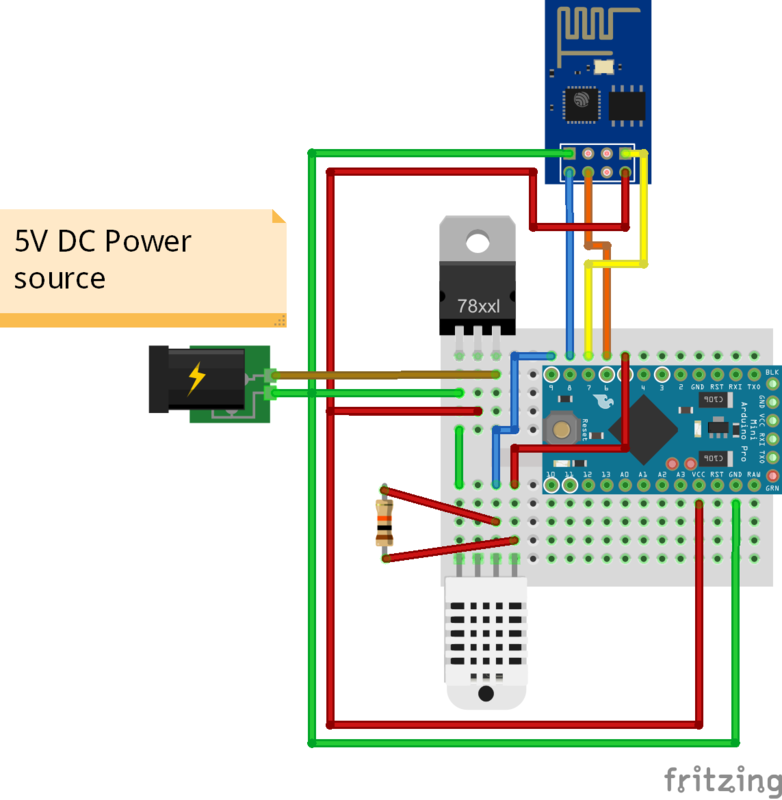 Data request starts by sending the sensor a low voltage signal followed by a high voltage signal and then waiting for a response from the sensor. This is called “handshaking”. The sensor then sends data in a sequence of low and high voltage signals. One bit consists of 50 ms low voltage signal followed by a high voltage signal. The value of of the bit (0 or 1) is determined by the length of the high voltage signal. We did not need to implement the procedure described above as somebody else had already done it. 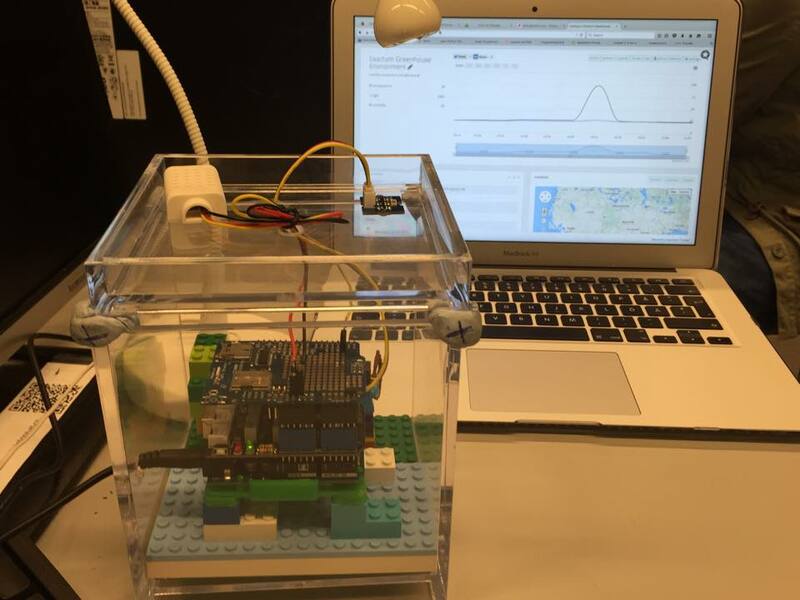 We used DHTlib to control the sensor. 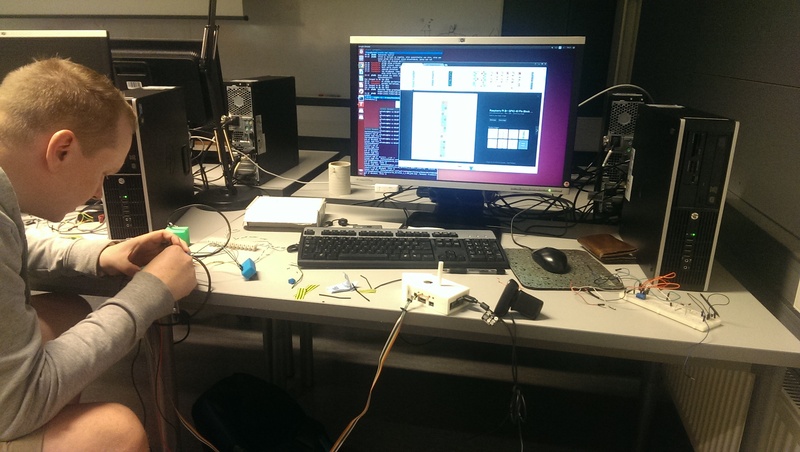 Reading other sensors was straightforward and no external libraries were required. 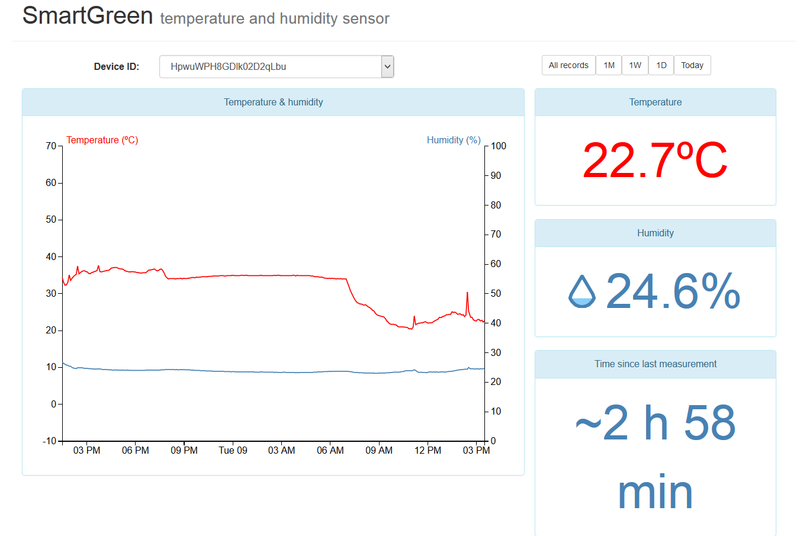 Sensor data was collected every minute during the testing period and sent to the backend server in a HTTP POST request. We used Adafruit CC3000 library and code samples that came with it to set up the network connection. CC3000 module tended to get stuck when initializing the connection. To avoid it we set up a watchdog: a timer that resets the system if the timer is not reset in eight seconds. 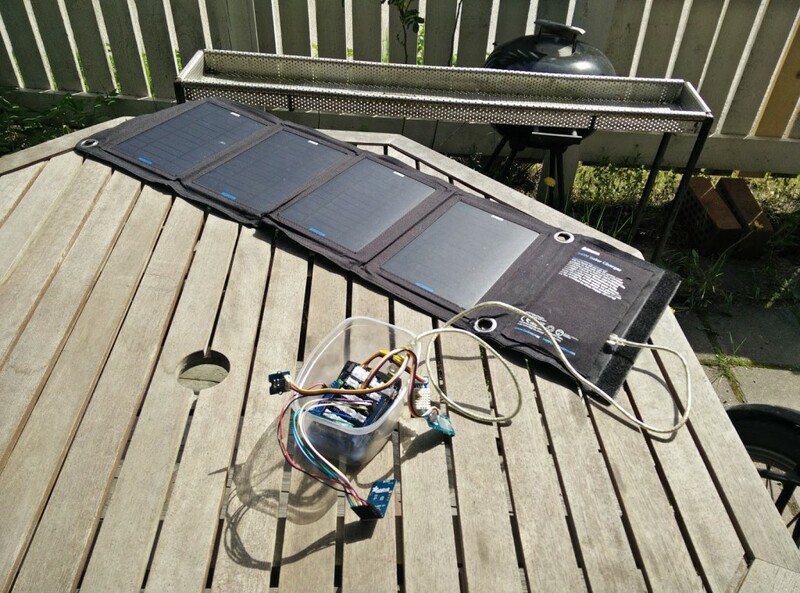 Testing the luminance sensor and Arduino with solar panels. Backend server was implemented using NodeJS, MongoDB and Express and was hosted on Heroku. Backend loosely follows REST architecture and returns all the data as JSON objects. Most of the data is served straight from the database except for a few aggregations for the latest and average values. The implementation uses Express for basic routing with generic code modules to allow easy extendability. Authentication is not yet supported, but basic skeleton for authentication middleware is present in the code. Currently the application is insecure when used in an open environment such as Heroku. We visualized the data with Angular.js using Bootstrap and angular-chart.js libraries. 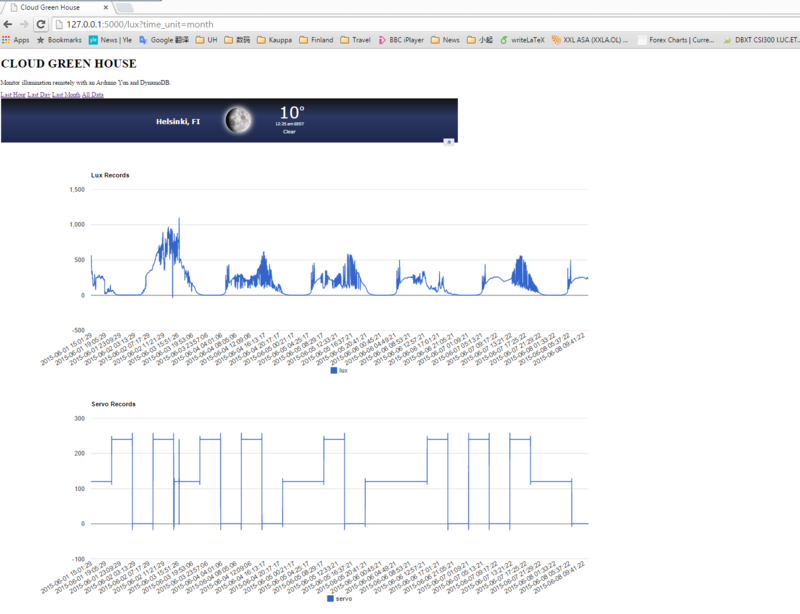 The dashboard is responsive and reactive, so it fits on every device and time series information is constantly updated. Basic information displayed is temperature, humidity, amount of light and if water needs to be added to the tank. 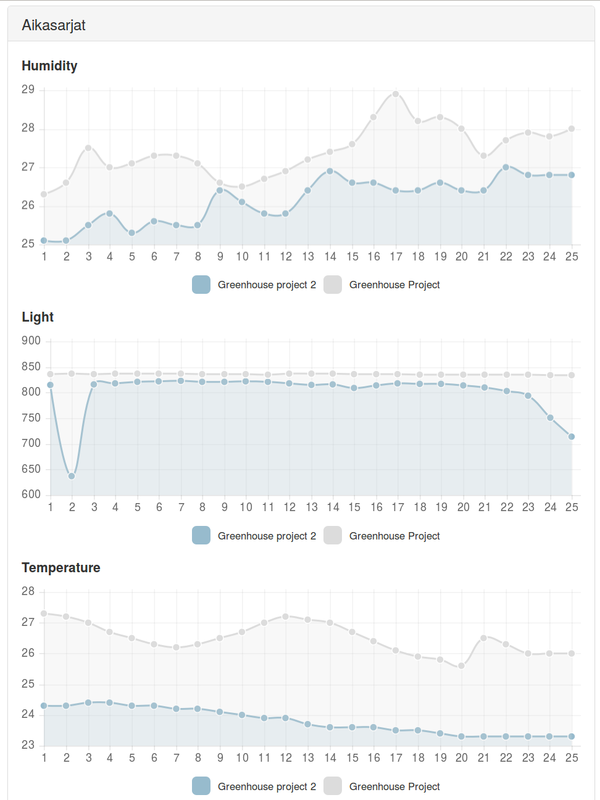 Time series charts displaying real data (Greenhouse project 2) and dummy data (for testing purpose). Additionally, historic information on temperature, humidity and light levels is shown in time series charts. Reactivity is accomplished by retrieving the data from the backend service in 10-second intervals and updating the time series charts accordingly allowing the user to see changes in real-time. This front-end lives in its own Heroku instance and is supported by a static NodeJS file server. Information is retrieved from the backend service with basic HTTP GET requests using Angular.js $http provider. We designed a hydroponics system which consists of a water tank including a pump and plant modules connected to the tank. Plant modules are simple cubic boxes that can be lined up to make the system extendable. Inside each module, a removable holder supports the plant leaving only its roots in contact with water. We used TinkerCAD to create the STL models of the parts. 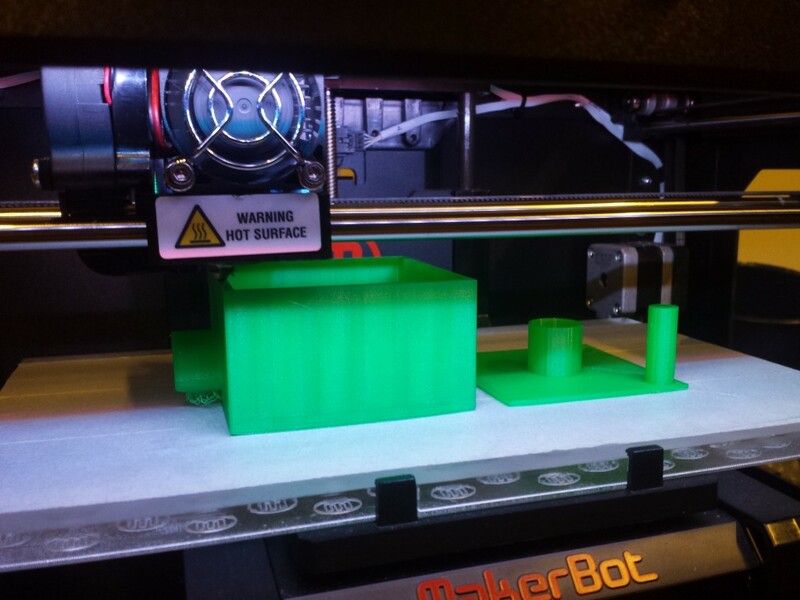 Printing was done by Makerbot Replicator 2, which used polylactic acid (PLA) as feedstock material. 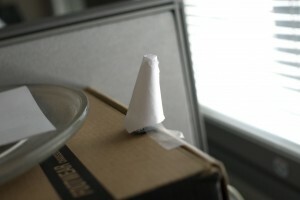 PLA is a biodegradable derivative of corn starch. 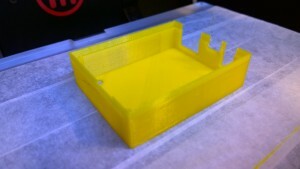 First we printed a plant module using standard quality and 15% fill density (amount of infill in, for example, walls). It took 4.5 hours to finish, so for the next module we used low quality and 10% fill density. This reduced the printing time to 2.5 hours. The printer had to be watched during the printing because sometimes PLA filament fed to the machine got tangled and snapped, terminating the process. 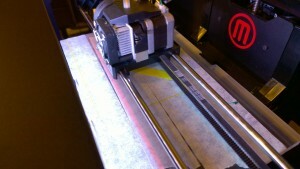 Printing the first plant module. First version of the plant holder on the right side. We made multiple versions of the holders and some other small parts. This was where 3D printer became handy: it was easy to see which designs worked and which did not after having the actual physical object in hand. After having all the parts printed we hooked two plant modules and a tank together, put the pump and a hose in place, added some water and started the pump to see if the system actually worked. Water flowed easily through all plant modules back to the tank but after a few minutes we noticed that some part of the system was leaking. We tried to seal the joints between plant modules by adding some silicone and glueing the modules together. It didn’t resolve the leaking issue as it seemed that water was leaking through the bottoms of the plant modules. Next we covered the interiors of the plant modules with water resistant paint but it didn’t help either. We are not sure if the plant modules could have been made waterproof by printing them with higher fill density. However, leaking was not really a major issue since the containers kept the water long enough to demonstrate how the system works. Below is a video of the final version in operation. 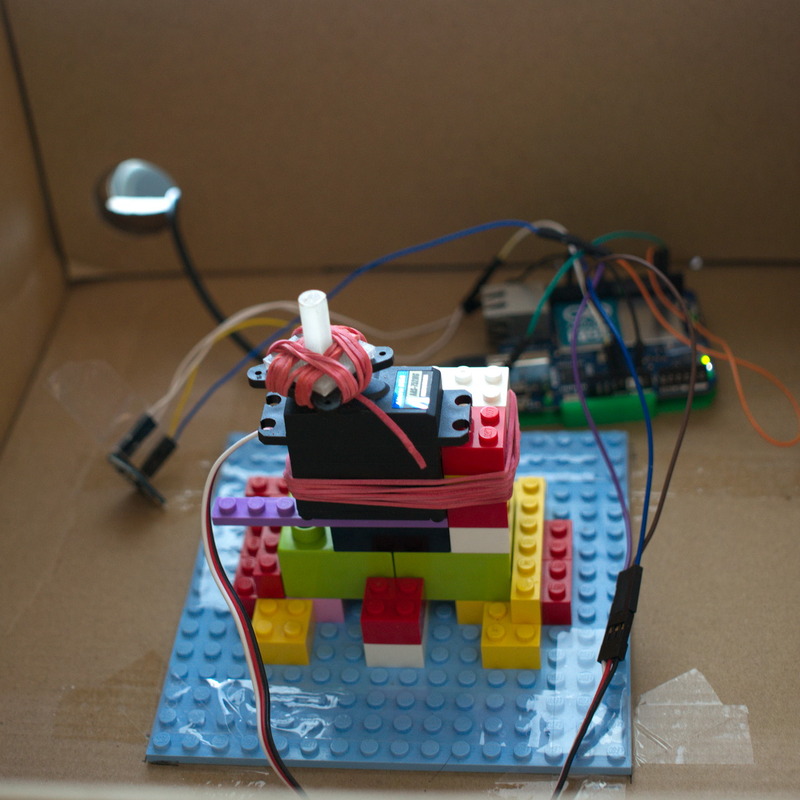 Arduino was placed in a wooden box to make sure it did not get wet. 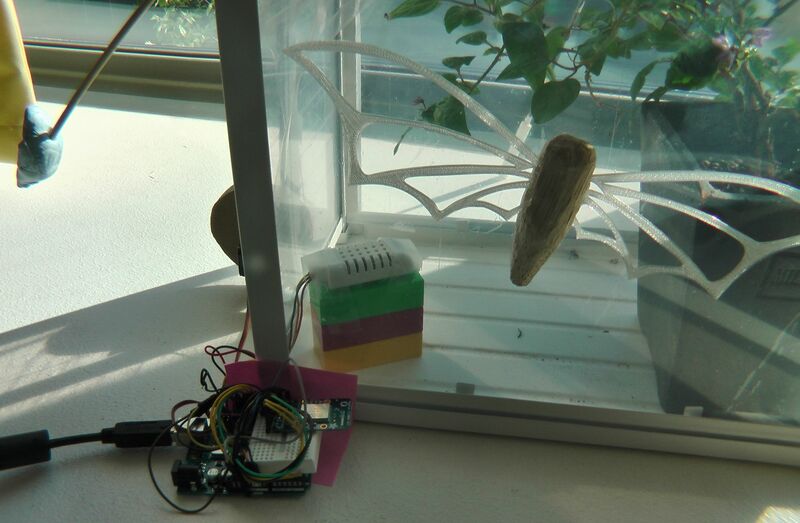 Luminance and temperature & humidity sensors are on top of the wooden box. 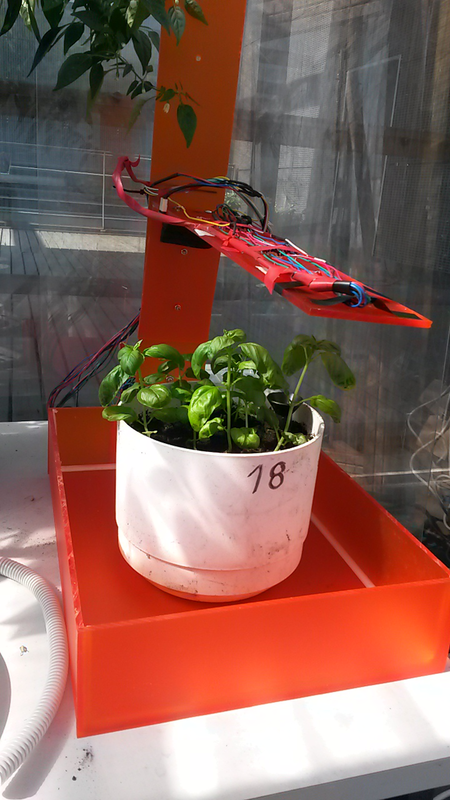 The plant module with a plant in it is filled with LECA. 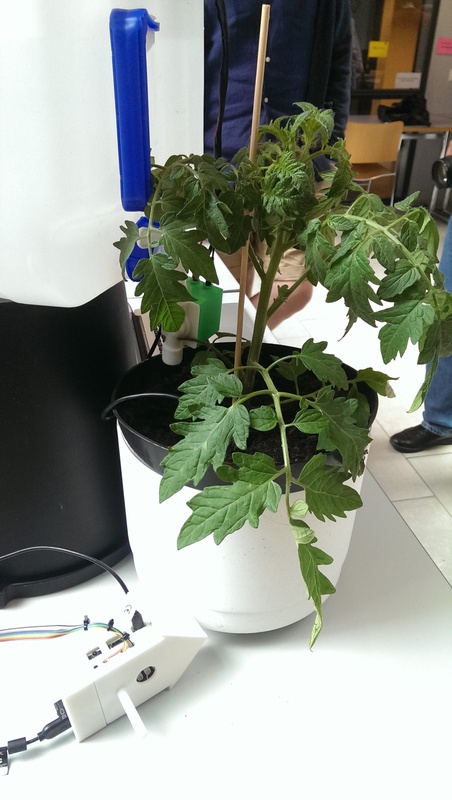 This entry was posted in Yleinen and tagged 3D printing, AngularJS, Arduino, Hydroponics, MongoDB, NodeJS on 22.6.2015 by Jarkko S Lagus. 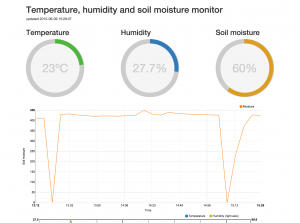 In this brief blog post we explain how we built a small system that monitors the temperature, air humidity and soil moisture of a small greenhouse or a plant pot. The prototype was implemented as a 2-man team with Mika Aho and Jyri Lehvä. The focus of the project was more on the software than on the hardware and the goal was to get to know the very basics of Arduino environment and learn something new about web programming in general. The idea of the system was as simple as providing information about the environment of a small greenhouse to the gardener. We felt that monitoring the temperature, air humidity and soil moisture were the most important metrics we should be able to provide. To achieve that, we selected two sensors. One for the soil moisture and the second one to monitor the temperature and air humidity. 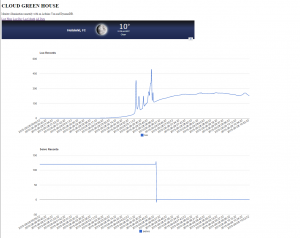 The metrics from the sensors were saved to an online database and presented by a web application as graphs and charts so that the gardener can browse them with any modern web browser. 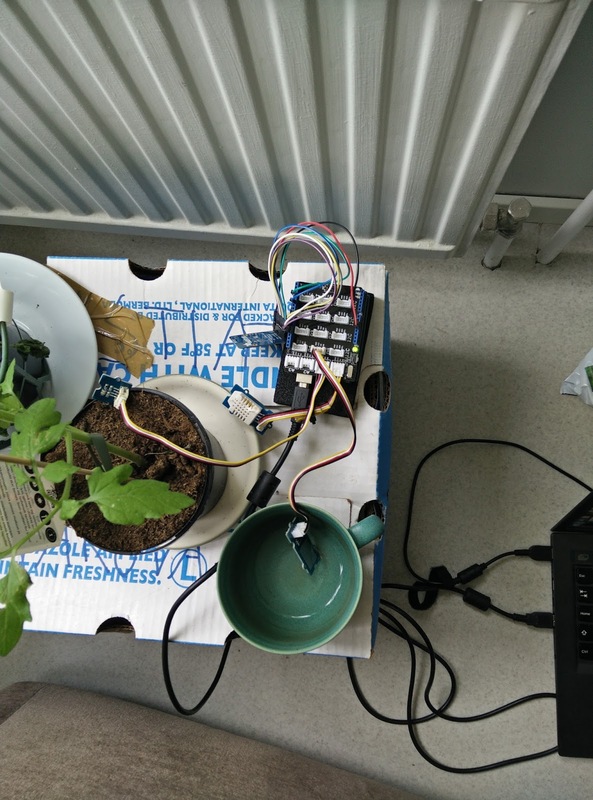 The hardware used consisted of Arduino Yun and two sensors; AM2302 for temperature and air humidity and a Seeedstudio Grove sensor for soil moisture. 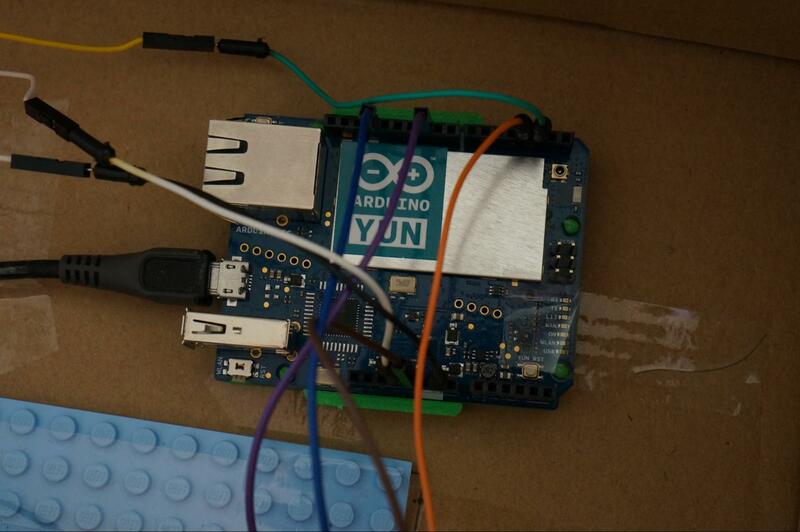 We chose Arduino Yun because it felt like an easy device to use; it runs a Linux and contains a Wi-Fi chip. All we had to do was to setup it, plug it to a laptop with Arduino IDE and connect the sensors. After that we could just start writing code. Very Easy! For the Arduino Yun we wrote a simple program that reads the input from the sensors attached to it every 10 minutes. The input from the sensors is then formatted to JSON and pushed to Firebase which is a web service for storing and querying data. The delay between reads from the sensors can be configured to any value that fits the best. The web application was built using Nodejs, ExpressJS and Firebase as the backend. 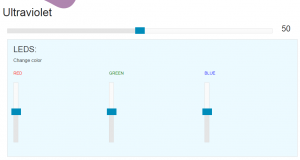 The frontend was built using AngularJS, Angularfire and using D3js to draw the charts. The code can be found from Github (https://github.com/jlehvae/exgreen2k15). The application was deployed to Heroku (https://guarded-mesa-9835.herokuapp.com/). The most significant challenge of the web application was to correctly visualize the data. For visualization we used Angular directive called Angular-nvD3. The Angular-nvD3 didn’t have very specific instructions on how to format your data so that it is correctly visualized and that’s why we had to take a trial and error approach. Configuring the charts correctly and formatting the data properly can take a while if you don’t have any previous experience with D3js. After we figured out the correct way to input the data, we were getting charts that didn’t look quite right. Soon we found out that we were actually missing a specific CSS file. After adding the missing file everything pretty much started working. 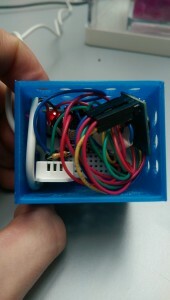 The final step was 3D printing a case for our Arduino. We had no experience working with a 3D printer before. It was surprising how easy it was to print the case. It turned out the Internet is full of readymade 3D models for different things. It took only a couple of minutes to search for a model that is designed for Arduino Yun. Only problem with the model was that we had two wires that needed holes on top of it so we could have the sensors attached while the Yun is in the case. We made the holes using Tinkercad (https://www.tinkercad.com/). It’s a website that let’s you import and edit 3D models using a web UI and export them back once they are modified. 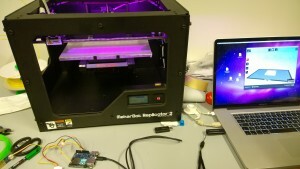 We used Makerbot Replicator 2 as the 3D printer. It was easy to use; just add the file of the model you want to print using the MakerWare and press start (we pretty much used the default values for everything). Printing the case took around 2 hours in total. 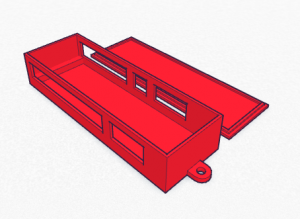 The top and the bottom part of the case had to be printed separately so the case wouldn’t break apart during printing as there would have been nothing to support the roof of the case. The top part of the case was printed upside down so the roof was supported facing against the floor of the printer. There were some problems with the moisture sensor as the readings before and after watering a plant were not that different. 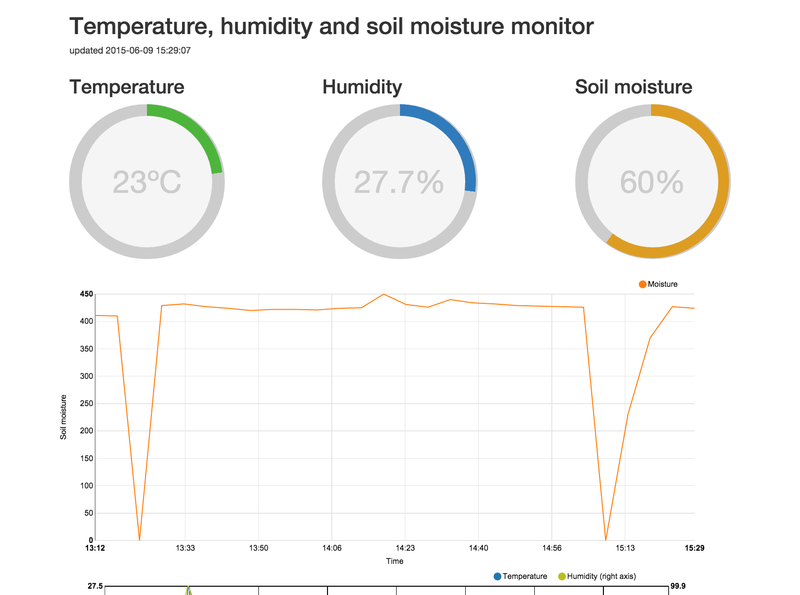 The plant in question was supposed to be quite dry yet the sensor gave readings of 400 ish (according to Seeedstudio this means that the soil is moist) and after excessive watering the readings only went up by around 40. The fact that our sensor had been used before and appeared quite worn probably had something to do with this. What we found out was exactly what you’d expect: the sensors (and thus our charts) correctly reacted to changes in the environment. This didn’t really mean that the data was valid, though. If we had one or two more copies of the sensors we could have tested if they are all giving out same metrics in the same conditions. Now there was no way of knowing if the sensors were accurate or if the data was valid or not. This entry was posted in Yleinen and tagged 3D printing, AM2302, AngularJS, Arduino, Firebase, Yun on 21.6.2015 by Jyri J Lehvä. We wanted to have a log of the weather in the greenhouse in our Exactum building, with PC logging and graphs. 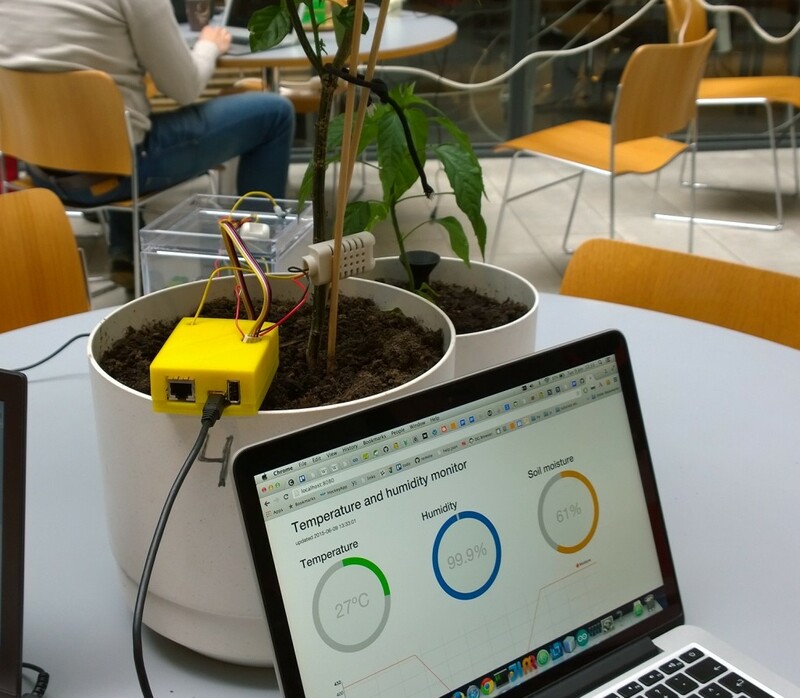 So we made a device which measures the real-time environment variable from multiple sensors in the greenhouse, from where the results can be easily checked and understood. 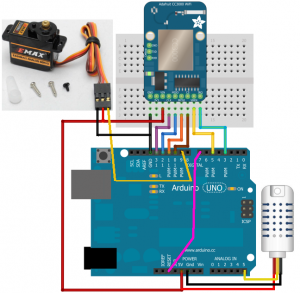 The arduino UNO board receives the information from the sensors and pushes them to a database on the cloud with the help of the adafruit CC3000 wifi shield. 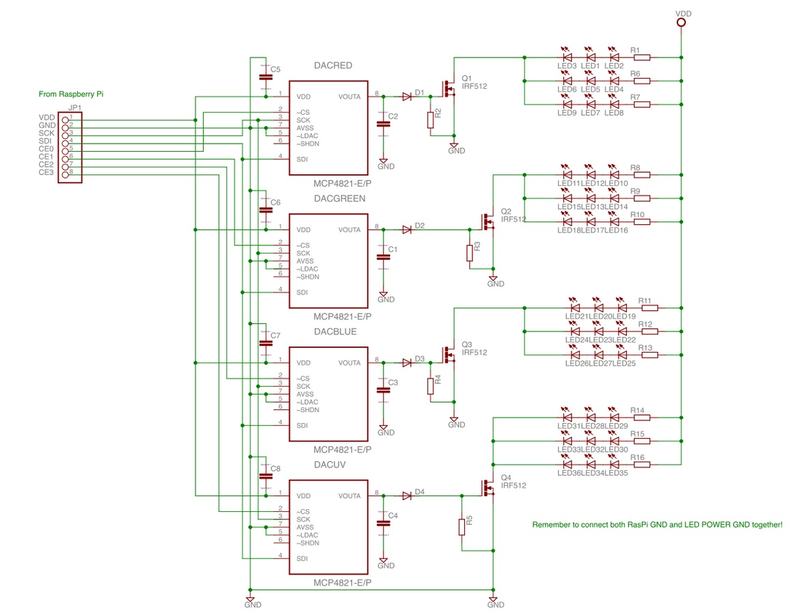 The data stream on the SparkFun database is then analysed and prepared as graphs using the Analog.io APIs. 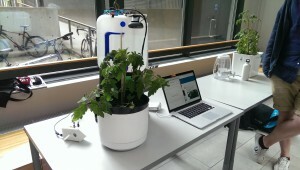 This system can be used to monitor, for instance, how much sunlight a specific type of plant is getting. So basically we can use the information from the data to analyse whether the environment is conducive or detrimental to the growth of specific kinds of plants. The source code of our project can be found here. 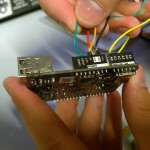 And here is the link to our SparkFun database. Also, this is where you can see our desktop application with the graphical view of the data (on analog.io). P.S. 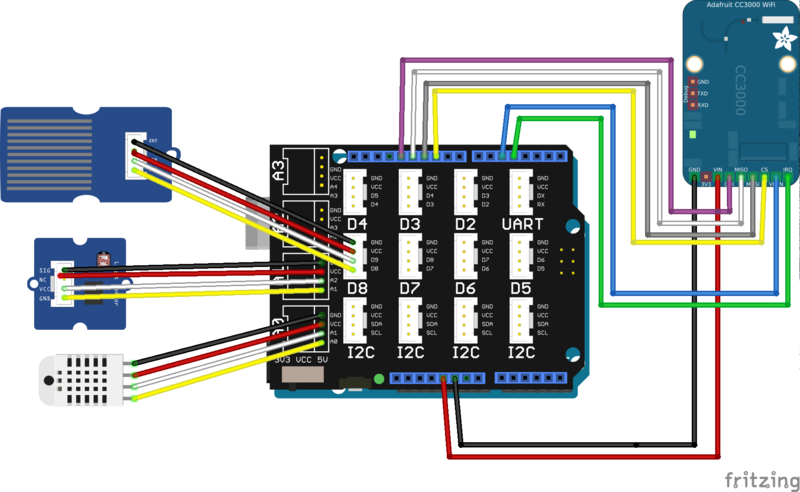 We haven’t shown Grove-Base Shield and Adafruit CC3000 WiFi Shield in the wiring diagram, due to some fritzing library issues. Adafruit CC3000 Breakout WiFi chip was faulty: We discovered it after repeatedly trying to connect to the network and failing. We had it replaced with adafruit CC3000 WiFi Shield. Connecting to firebase: We tried multiple ways to send data to firebase for many days, but kept getting stuck at some point. We switched to Thingspeak and eventually to Sparkfun due to its very easy-to-integrate api. 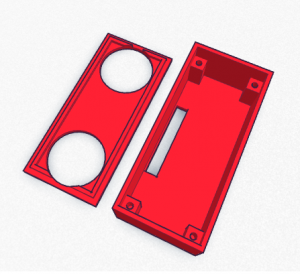 We found a perfect Arduino case to 3D print on Thingiverse but could not resize the parts separately on Tinkercad, so we left a comment to the designer. The author was answered very quickly and the communication was a success, even though the model could not unfortunately be changed. 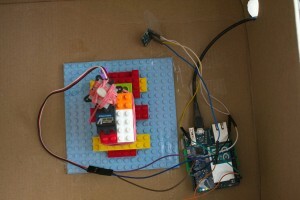 So we switched to another 3D Lego mount for Arduino, here is the link. We has originally planned to include other sensors namely carbon dioxide sensors to measure the changes in CO2 concentration around plants, toxic gas sensors and air pressure sensor to predict when it might rain. Along with that, we also wanted to be able to predict the greenhouse environment based on incremental history from our data, with the help of machine learning algorithms. We could not the due to the time constraints. We think being able to see the data and control the system from out smartphone is also a good idea. So we currently working with the data we have to make a mobile application. We had hardly any previous knowledge of hardware based projects. We took a while to pick up things from scratch, making our way through learning, debugging and testing the hardware issues. 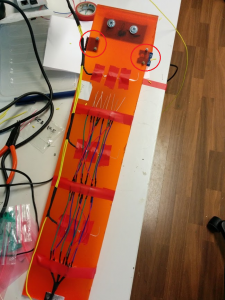 The hardest part of the project was probably writing the code to send a POST HTTP request to the database and figuring out how the various arduino libraries exactly worked. The greenhouse exactum course tutors were of great help to us, and the course gave us the motivation and the confidence to develop more arduino based projects. 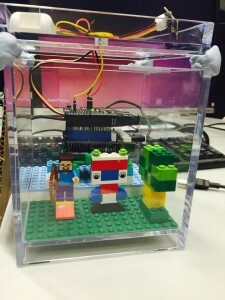 This entry was posted in Yleinen on 19.6.2015 by Yan He. How much do you care of your plants? Do you know whether your plants in the greenhouse are boiling, freezing, or inhaling properly? Who is taking care of your plants while you are away enjoying the summer in your “loma mökki”? Your plants might be praying that someone opens the greenhouse window, but you can’t hear their voice, you can’t understand their language. 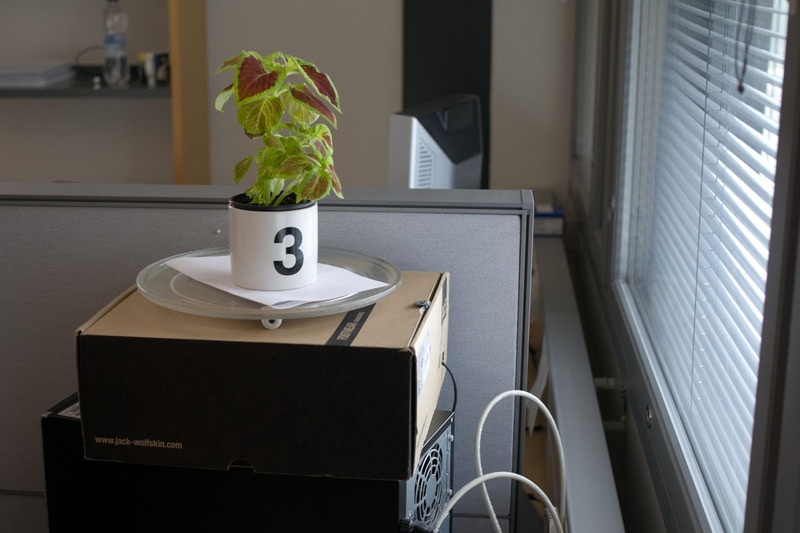 One solution might be to hire a plant-human translator, so that he can translate their language for you, understand their claims, and open or close the door or window of the greenhouse accordingly. This solution might sound quite reasonable to you, but we believe that our proposed alternative will make you think otherwise, as you will never have to worry again for the wellbeing of your plants. Side view of the system and mini greenhouse. 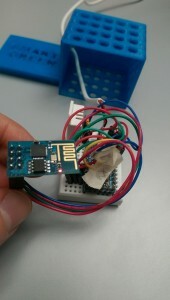 Arduino, adafruit cc3000, and dht22 sensor. Count also the beautiful butterfly. Top view of an artistic hand work. We built a greenhouse Auto Ventilation System. 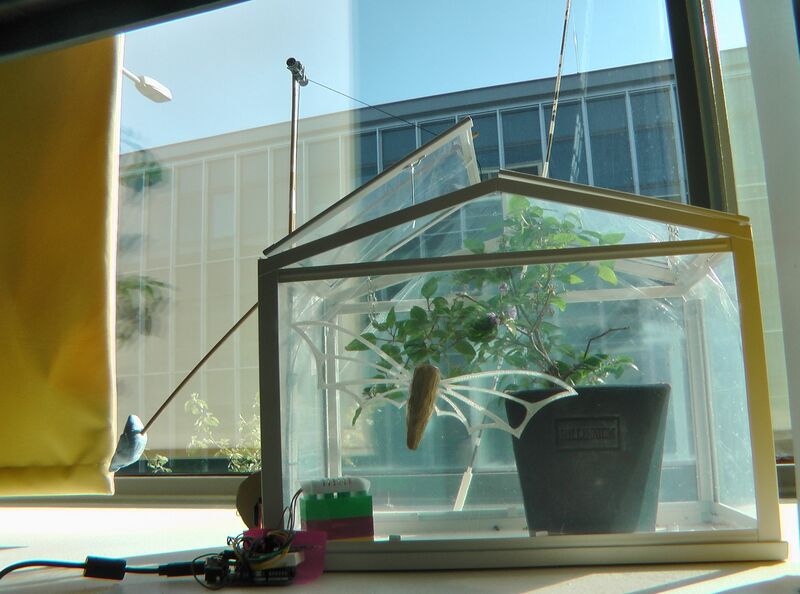 In order to prototype our system, we used a mini greenhouse made of transparent glass. An Arduino UNO microcontroller was used to control the system. A wired dht22 sensor (Adafruit AM2302 wired, http://www.adafruit.com/products/393) was used to sense the temperature and humidity of the greenhouse, and a servo motor was used to open or close the window of the greenhouse according to the signals from the microcontroller. 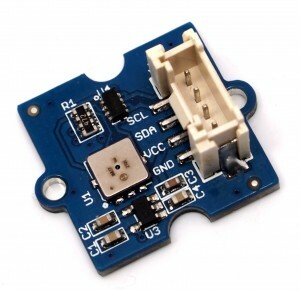 Additionally, an adafruit cc3000 wifi breakout board was used to connect to the internet in order to feed on-line the sensor readings to to a data server. 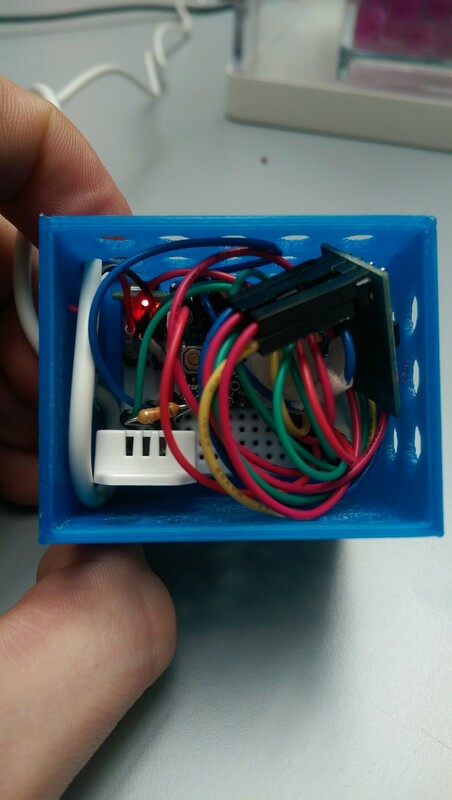 We followed the wiring and source code library of adfruit cc3000 from https://learn.adafruit.com/adafruit-cc3000-wifi , dht22 sensor from http://www.adafruit.com/products/393 (another source, http://playground.arduino.cc/Main/DHTLib ) and Servo motor from http://www.arduino.cc/en/Reference/Servo. The following figure shows the complete wiring. 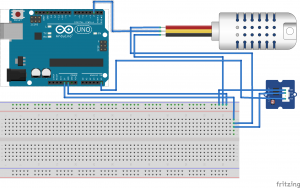 Arduino UNO reads the temperature and humidity data from the Adafruit AM2302 (wired DHT22) sensor every ten minutes, controlling the opening or closing of the greenhouse window through the rotation of the servo motor. The rotation of the servo motor rotation angle (0º – 180º) is mapped to the temperature (20ºC – 30ºC) and to the humidity (25% – 50%). 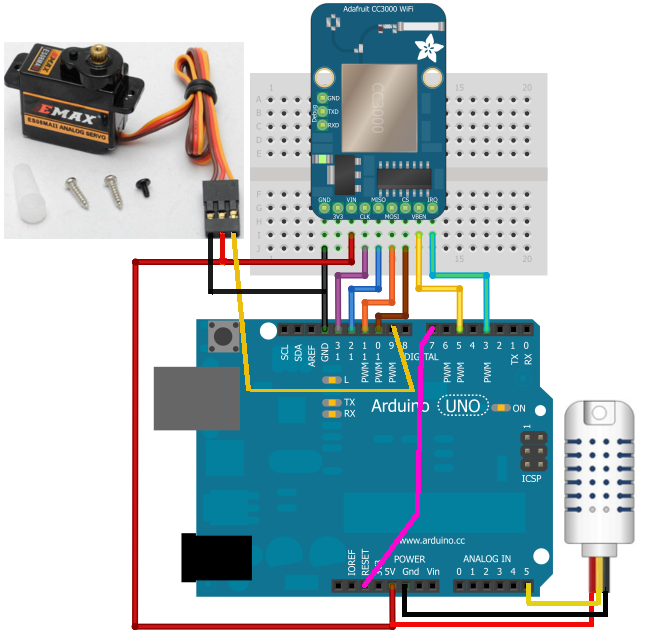 Arduino UNO sends the temperature, humidity and servo motor angle data to a data server through the Adafruit CC3000 WiFi module. Data in the server is logged together with the corresponding timestamps. Additionally, an automatic plot is generated to facilitate the interpretation of the sensor data over longer periods of time. Following the easy tutorial from sparkfun (https://learn.sparkfun.com/tutorials/pushing-data-to-datasparkfuncom/all) we pushed the data to the sparkfun’s cloud data server https://data.sparkfun.com. 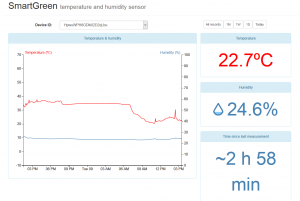 You can see data from our system at https://data.sparkfun.com/iot_uh_ia_os. Next comes the visualization. 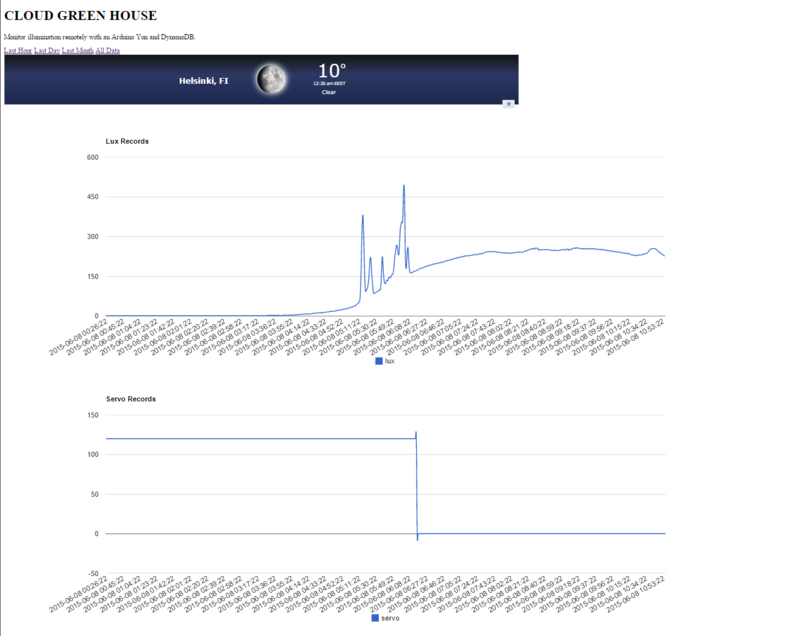 We followed the tutorial and sample source code from http://phant.io/graphing/google/2014/07/07/graphing-data/ of using google chart to draw the live chart from the data cloud. To draw chart we used data only from first page of the data server. You can see the live chart at http://www.cs.helsinki.fi/u/iahmed/iot_graph.html . After a pilot test of 2 days we figured out that the cc3000 wifi module was getting stuck after a couple of attempts to connect to the server, if the gateway or server were not responding. We then started to surf on the internet and forums to find a solution to the problem, but we could not find any suitable solution. The best way we found to solve the issue was to restart the system when it was getting stuck. In order to do that, we connected the reset pin with the digital input pin 7 using a wire, and added some chunks of code where necessary that sent a low pulse to the reset pin, via the digital input pin 7. With thefixed issue, we tested the system for about a week. We realised that our system was working fine, but the data.sparkfun.com server most of the time causes “504 Gateway time out error”. In the future, we are planning to change the data server with a more robust one. We used Serial. print command to get some feedback from the Arduino to know what it is doing, for debug purposes. 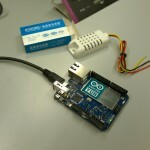 It works fine when we plug the Arduino into the PC, but stop working after a while if we run the system without connecting to the PC or any other serial receiver. Then we figure out that the Serial.print command blocks the system because the output buffer of the serial transmitter is getting full. We went through the source code of the Arduino library, and found in HardwarSerial.cpp, there is a code line that blocks the system until the transmitter’s ring buffer gets a free space. if(tmpCounter>200) //wait for a while; give a chance to the serial device to receive data, if //connected. It is always fun to work with arduino and physical devices and hardware. It forces you to take into account all the different components involved in the designing and implementation in the early stages of a system, taking care of the electronic circuits, controlling logic, power, filter, resistances, wiring and soldering, and so on. The Internet of Things course helped us to re-learn those. Additionally, the course made us leave our comfort zone, and think out of the box, as we faced multiple software, hardware and even physical (such as when building the mechanism to control the window) challenges. The best part is that we really enjoyed solving them, especially the latter ones! This entry was posted in Yleinen on 5.6.2015 by Imtiaj Ahmed.